Treatment is divided into advice on diet, lifestyle, prescribing medicine and therapeutic techniques. When taking treatment the patient often assumes that it is solely the responsibility of the physician to cure them, however this is not the case. When seeing patients I always stress to them that it is a team effort. It is like a football team; to have success you need a good manager, good discipline, good diet and good players. The manager has to give proper instruction and guidance to the players but they also have to listen and take responsibility if they are to win. So in this way patients have to listen to the advice of the physician on changing their diet, lifestyle and regularly taking the medicine at the right times; after this there will be a positive result. I tell my patients that Tibetan medicine is not a “quick fix” form of treatment and that it requires patience and perseverance on their part for it to succeed. Over the last fifty years the diet in the west has changed quite dramatically, but for the worse and not for the good. This is because of modern methods of food production which include the use of growth hormones in animals, preservatives, artificial colourings and flavourings, high fat, salt and sugar contents in products, food processing, and the use of anti-biotics to boost nutrition. For example it is totally unethical to feed a vegetarian animal with processed offal and this can be seen as one of the reasons why we have had so many problems with mad cow disease in this country. So all of these factors can deplete food quality. We are overfed but under nourished. Each of us has a responsibility to promote the use of real organic foods which I notice are now becoming more available and if we continue to demand it, more organic food will be produced and as a result our next generation will be healthier. In the rGyud-bzhi there is great emphasis on dietary principles, and there are three whole chapters devoted to diet. They deal with classification of foods and drinks, their use, precautionary advice, and instruction on consuming the right quantity of food and drink. In Tibet there was not a great choice of fruit and vegetables and therefore in this section I have added things which are not mentioned in the Tibetan medical texts but which are relevant to us now. 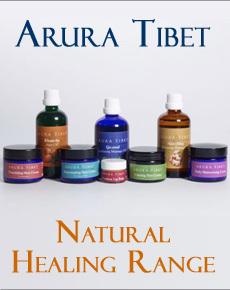 Tibetan pharmacology is extremely rich in both depth and variety, it makes use of gems, minerals, metals, soils, saps, woods and herbal plants. Medicine can be a combination of as little as 3 ingredients or as many as 157. At present there are approximately 250 different types of medicine which are manufactured. When prescribing medicine there are ten factors to take into consideration. These are the individual body constitution of the patient, strength of the patient, age, metabolic rate, condition of the disease, location of the disease, climatic factors, time of manifestation, bodily nature, and checking to see if the patient is used to taking this form of medicine. After these ten factors have been considered we treat each patient individually; in Tibetan we say that if we do not consider all the above factors in relation to each individual case, it would be like putting the load of a yak on the back of a sheep, or a sheep’s load on the back of a yak. In 1717 Geshe Tenzin Phuntsok’s materia medica of Tibetan medicine called Dri-med Shel-gong Shel-phren, mentioned 2,294 different medical substances used in Tibetan medicine. In the rGyud-bzhi it says that our bodies are made of five elements and the Nyipa-Sum are caused by the imbalance of the five elements The antidote which is comprised of herbs and minerals is also generated by these same five elements. 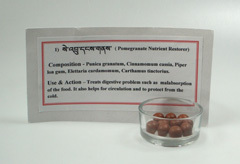 Following from this the five elements generate the six primary tastes of the medicines. Medicines which are combinations of sweet, sour, salty and hot taste will help eliminate problems related to Loong. 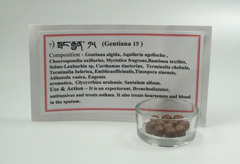 Medicines which are combinations of bitter, sweet and astringent taste will help eliminate problems related to mKhris-pa. Medicines which are a combination of hot, sour and salty taste help eliminate problems related to Bad-Kan. In Tibetan medicine most medicinal preparations are combinations of the 8 potencies which are - heavy, oily, cooling, blunt, light, rough, hot and sharp. 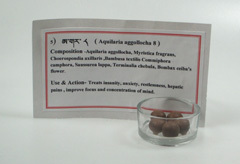 In greater detail these 8 potencies can be divided into the 17 properties which can counteract the 20 subtle natures of Loong, mKhris-pa and Bad-Kan.
Earth has the following qualities - heavy, stable, blunt, smooth, oily and dry. These qualities pacify Loong disorders, because the nature of Loong is light, movable, cool, rough, hard and thin. Earth can also aggravate Bad-Kan because they share the same qualities. Water has the following qualities - fluidity, cooling, heavy, blunt, oily and supple. These qualities pacify mKhris-pa disorders, because the nature of mKhris-pa is oily, pungent, hot, light, sharp and moist. Water can also aggravate Bad-Kan because they share the same qualities. Fire has the following qualities - hot, sharp, dry, coarse, light, oily and mobile. These qualities pacify Bad-Kan disorders, because the nature of Bad-Kan is cool, blunt, smooth, sticky, heavy, steady and oily. Fire can aggravate mKhris-pa because they share the same qualities. Air has the following qualities - light, mobile, cold, coarse, pale and dry. These qualities pacify Bad-Kan disorders. Air can aggravate Loong because they share the same qualities. 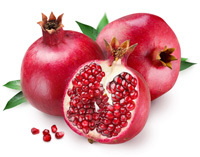 1) The plants should grow in their own natural habitat, for example a cool potency medicine such as gentian should grow in a cold climate like Tibet, and a hot potency medicine such as pomegranate should grow in a hot climate like India. The surroundings of where the plants are grown should be clean, spacious and have good light; plants grown in these surroundings should also be healthy, undamaged by insects and the weather. 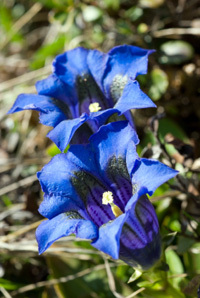 It is considered bad to pick plants grown near such places as cemeteries and places of refuse. 2) The plants should be collected at the right time. Different plants grow in different seasons, and all the different parts of the plant should be collected at the appropriate time. 3) Detoxification involves the separation of the toxic parts of the plant, after the plants have been collected their toxic parts now have to eliminated. These toxic parts will not cause death, however they are removed in order to protect our digestive system, seven bodily constituents and subtle flow of Loong energy. When I was a student at the Tibetan and Astrological Institute it was part of our studies to go to Manali in Himachal Pradesh every year in September for one month herbs collection. This area in the Himalayas is very close to Tibet and a lot of the plants which grow in Tibet can be found there also, and it was very moving and sad for us to know that our own country was so close to where we were. As most of us had been born in India, our second home, Tibet was a place to which we had never been. A Tibetan medical professor would take us and introduce us to each and every individual plant; it’s name, taste, potency and usage. It was a wild and beautiful place with glacial valleys, natural waterfalls and sheep roaming freely, and sometimes we would be in competition with the sheep to get to the same plant! We would get up early in the morning and return in the evening, spending the whole day collecting herbs. We would then wash the roots of the plants in the local water which was so cold that while washing the roots we had to stop for short periods because we couldn’t feel our hands. Once they had been washed all the different parts of the plant had to be separately sorted and allowed to dry. If the plant was cool potency it was dried in cool air and shade, if it was hot potency it was dried in the sun and fire, any potential pollutants nearby would affect the potency of the plants and therefore were avoided. 5) Duration and potency. For maximum potency, medicines should contain plants which were picked in the same year, the older the plant the less potency it has and therefore it’s healing effect will not be so great. 6) Following pharmacological formula to make the plants easier to ingest and assimilate. 7) Compounding of ingredients for proper usage according to the pharmacological texts.